Days at TRACC are filled with work dives, fun dives, classes, reading, species identification, and the inevitable hammock time in the heat of the day to recover brainpower and refresh the senses. A few times a week, once the heat of the day has diminished, the evening is filled with the communal labor of creating artificial reefs. The steady sound of the gaping mouth of the cement mixer turning and churning is the background to this labor, and the majority of camp contributes as much as they can. Some volunteers peel labels off glass bottles and cut twine for handles; others dig holes in the sand and cut corners out of cardboard boxes to create frames for bottle reefs. 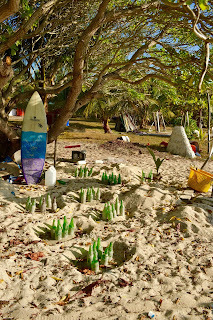 Still others bend PVC piping and ball netting for a different type of reef or scour camp for useable material and housing for sea creatures, asking, “If you were a fish would you live in this?” Then, the cement gets poured and the reefs are left to dry. 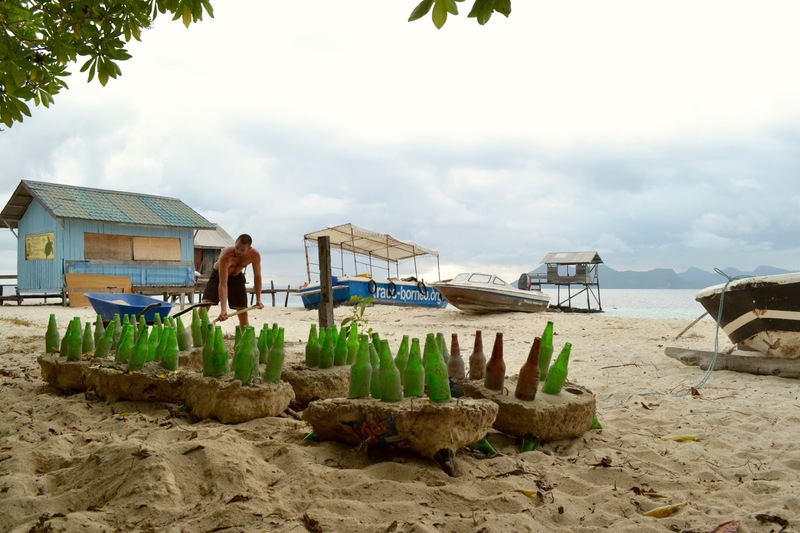 All artificial reefs built at TRACC are created with a specific biological niche in mind; for bottle reefs it is often the shallow reef crest. 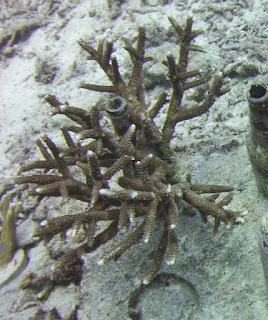 After the cement dries, the bottle reefs are placed throughout the various depleted reefs around Pom Pom Island, and in a twisted and spiny line along the reef crest just outside of TRACC. Once placed, we plant them with collected broken coral which immediately attracts a rainbow of little fishes and crustaceans who come to check out a new coral home. A little farther down the slope, nets are draped and planted with the gentle pastels and sways of soft corals steadily in motion like pulsating flowers in their filtering and feeding, and are already being utilized by the sandy brown speckled moray eel that one must be careful to avoid when planting with coral. 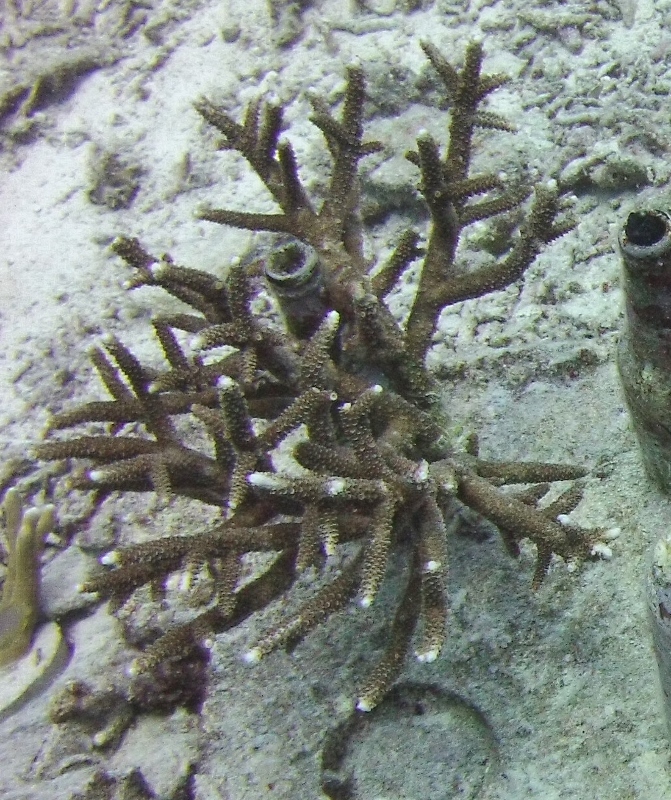 Bottle reefs are tipped upside down and sunk as to create steps and niches at slightly different depths to attract a greater diversity of species. Plastic crates combined and submerged to create the aptly named “biodiversity reefs” – attract a great variety of magnificent sea life, ranging from large brown and black spotted sweetlips hiding in the shadows, to cute little candy crabs nestled in the nephtheidae soft coral reaching its pink broccoliesque arms towards to light, and a whole spectrum of brightly colored fish, crustaceans, and corals, as well passing fantastical visitors like the grumpy frogfish. 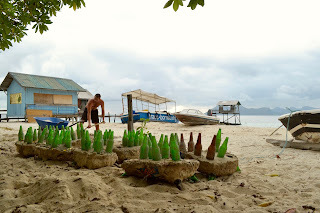 Still more artificial reefs are created as by pouring cement into flat circular “biscuits” with holes poked into them for coral planting in the shallows to be utilized as nurseries for creatures and coral alike. 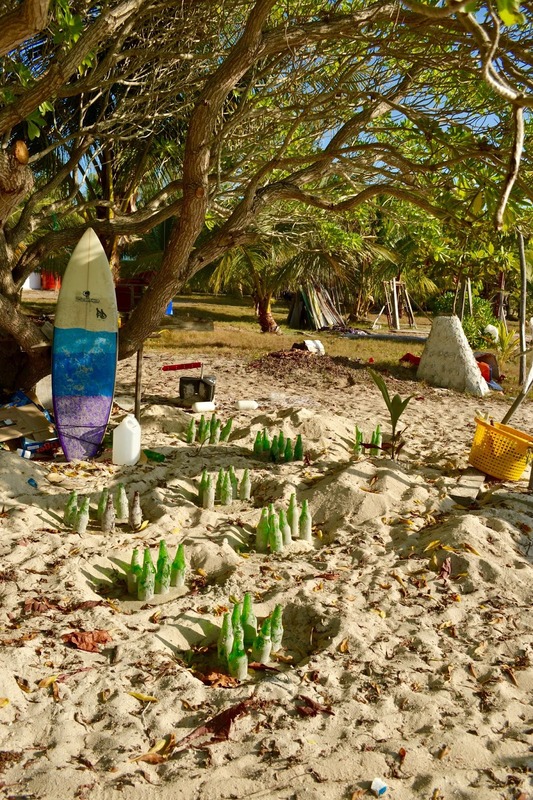 At greater depths PVC pipes bent into igloos, tipis, and a swim through gather algae and coral on their surface to create space for sea creatures seeking refuge from predators. Tires sunk at an even greater depth are planted with deep water gorgonian coral and black coral, which are beginning to spread their deep purple fans ever wider and spiral ever farther upwards. These deep-water structures are often inhabited by octopus and other burrow loving creatures slinking back into the crevices of empty tire tubing. 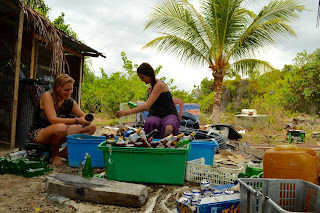 It is so satisfying to participate in the whole process of the artificial reefs – the making, the placing, the planting the corals, and the intense satisfaction of seeing them populated by creatures in what was once a depleted reef of mainly coral rubble. GEF /SGP for Malaysia who are helping our community activities.